I spent my early childhood growing up in the Bronx, New York City. Part of getting to live in NYC is getting to actually eat good pizza. A good New York style pizza is going to have a thin and crispy crust, but still be soft enough to be folded. This is still my favorite style of pizza. Thick crust, deep dish, Sicilian are all fine and good, but its not a New York style pie. After moving from NYC, the further I move away from NYC, the harder and harder it becomes to find an NYC style pizza. In Pittsburgh, I only know of a couple places that come pretty close and that’s because they are run by former New Yorkers. Fortunately for me, I have another favorite type of pizza, chain pizza. Chain pizza usually have ingredients like the dough shipped in and the pizza oven has a conveyor belt. People will rag on Pizza Hut, Dominos, Little Caesars, etc, but let’s be real for a second; are you ever actually disappointed with a pizza from one of those places or the similar? At each one of these places, you get exactly what you are expecting. The construction and cooking of the pizza is formulaic. 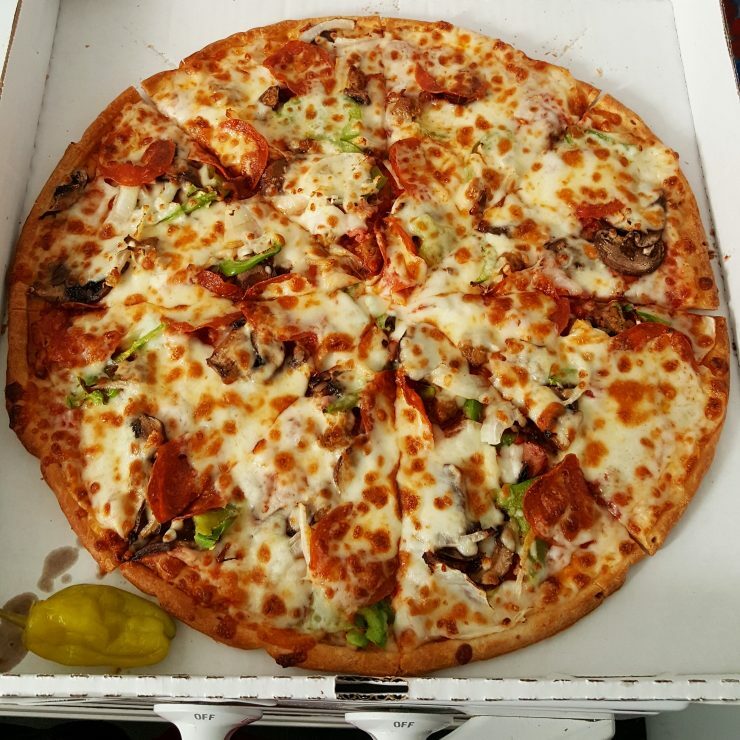 In the end, you receive a pizza that looks pretty damn close to what you saw on the commercial on TV. You know it’s going to taste great because it’s loaded with salt, sugar and oils. I generally will only get these pizzas if I can spend less than $9 per pizza or find a 50% off if you order online deal. 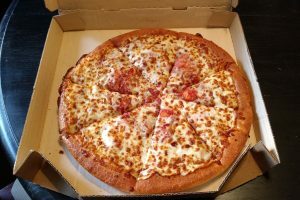 I will frequently go to Little Caesars because it is the best damn $5 pizza that is also within walking distance to my house. They are also the only $5 pizza within walking distance to my house. 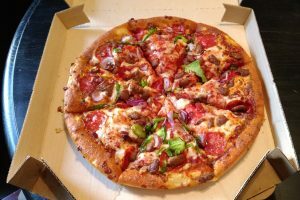 50% off deals are great because how else are you going to get a 6 topping pizza for $11. The pizza next to this paragraph is a great example of getting to overdo it on toppings. Once the price gets higher than this price range, it makes more sense to go to an independent local pizza place assuming you have a decent one in your area. Some of my favorite go to meals which will make me feel like a glutton are these type of pizzas. For years, depending on where I lived at the time would dictate where my cheap pizza would come from. Pizza Hut has always been my primary go to for cheap pizza. This is most likely because it was the most common fast casual pizza I have eaten over the years. I grew up with Pizza Hut buffet. It was a treat to get to go there for lunch and devour way too much pizza, pasta, dessert pizza pie and completely ignore the salad bar. Now I only get Pizza Hut if there is a $6 medium 3-topping code or 50% off. I normally get pan pizza but I am also a fan of their thin crust because I feel like I’m getting a cracker pizza. Little Caesars is the most consistent of all the chain pizzas because they have like 3 options, which I like for no surprises. I’ll also try the specials sometimes. The Little Caesars Smokehouse pizza was great just because it was covered in meat, but disappointing since it was made with BBQ sauce. Possibly the best part about these places is at that price point, it’s almost like an obligation or a personal goal to just eat the whole pizza in one sitting. Ordering Chinese food, going out for a burger, getting sushi, even going to a chain restaurant will cost more for much less food. There is nothing like that personal satisfaction when you have finished 8 slices of pizza combined with that feeling of gut wrenching fullness and disgust in yourself. It’s the best. These pizza places are also great when you want pizza fast while traveling. 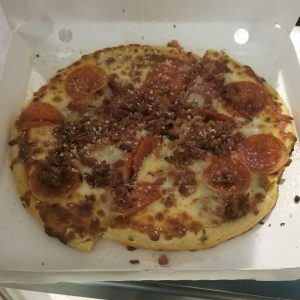 I was recently in the airport in Chicago and get a personal pizza from Home Run Pizza. This didn’t look like the best pizza I’ve ever eaten and wasn’t the best tasting either. However, look at it. The pizza is heavily covered in cheese and meat. What is there not to love? It was surprisingly satisfying in my 25 minute layover. My complaint is these pizza places are creating a trend that conveyor belt pizza ovens are acceptable for all pizza. Fewer and fewer pizza places have a traditional pizza oven. Instead, the pizza places are using the conveyor belt ovens. A regular pizza oven cooks the crust better and melts the cheese better. So remember, chain pizza is certainly acceptable. It’s not the best pizza, but it’s cheap and delicious. Do you really need anymore?